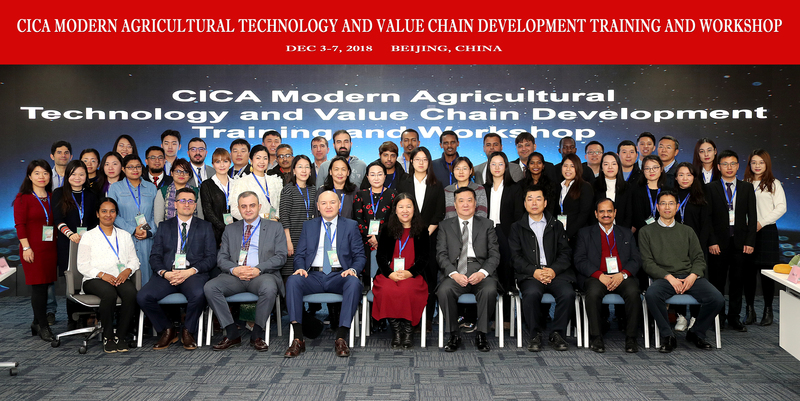 December 3-7, the CICA Modern Agricultural Technology and Value Chain Development Training and Workshop, funded by the Ministry of Foreign Affairs of China, supported by the Department of International Cooperation (DIC) of Chinese Academy of Agricultural Sciences (CAAS) and co-organized by Center for International Agricultural Research (CIAR) and Agricultural Information Institute (AII)-CAAS was held in Beijing. More than 80 participants from 17 CICA member countries and international organizations attended the workshop. H.E. Ambassador Gu Ziping, Mr. Bulat Zhaksygaliyev of CICA Secretariat ,Dr. Hao Weiping, DDG of DIC - CAAS and Dr. Nie Fengying, DDG of AII- CAAS presented at the opening ceremony. Development (IFAD), Food and agriculture organization of United Nation (FAO), DIC CIAR and Institute of Agricultural Resources and Regional Planning (IARRP)-CAAS gave presentations on value chain development and smart agriculture, covering topics such as inclusive agri-food value chain for poverty reduction, future smart food and the zero hunger initiative, China’s agriculture in transition, global food security, nutrition and poverty status, as well as the science and technology innovation in smart agriculture in China. Dr. Suhas Wani， former Director of Development Center of International Crops Research Institute for the Semi-Arid Tropics (ICRISAT) presided a policy dialogue session, where a cooperation proposal put forward by CIAR were adopted and the Network on Agriculture Value Chain Development under CICA Regime were signed subsequently. Participants also shared their experience related to the training topics, such as the Saffron market in Iran and the Agricultural Credit Cooperatives in Turkey, etc. Apart from in-classroom training, they also paid visits to the National Agriculture Technology Innovation Park, the National Gene Bank of Germplasms Resources, National Agricultural Library and the Deqingyuan Ecological Company in the suburb of Beijing.